Vitamin C cream is quite different from other creams. It rejuvenates the skin, moisturizes the skin, reduces aging signs, enhances complexion, and fights free radicals to prevent and restore oxidative damages. Most importantly, vitamin C cream can give you firm and healthy skin with a fair tone. But, when you can have the most benefits from the skin care products. Obviously, it is night. The night is a beauty time for skin. Your skin gets damaged throughout the day. And it starts repair at night for the next day. Because you have no tension of sun rays, smoke, dirt, dust or other pollutants at night. So, you can do something before going to bed at night that will be more effective for your skin. You should wash your face and apply a night cream before going to bed. It will help to get a clearer, smoother, and finer skin when you wake up. And nothing is as effective as vitamin C cream for nighttime skin care. See below some good quality vitamin C night creams. The key ingredients of this night cream are niacinamide, vitamin C, and rosehip oil. This cream hydrates your skin to reduce the appearance of fine lines, wrinkles, age spots, and uneven skin. InstaNatural Youth Express Night Cream gives you a youthful glow with an improved complexion. It nourishes and hydrates your skin with aloe vera, avocado oil, and argan oil. Both men and women can use this cream for a brighter and clearer look. This is an ideal night cream for dry and dehydrating skin. 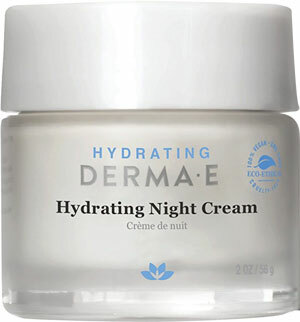 Derma E Hydrating Night Cream is a perfect blend of hyaluronic acid, green tea, aloe vera, vitamin C & E. It moisturizes to give you a plump, soft, and smooth skin. It acts as an anti-aging cream to helps your skin stay young. This cream also gives a soothing sensation to your irritating skin. It is 100% vegan and free from harsh chemicals. This night cream with vitamin C gives you a visible result within a week. It boosts the cell renewal of your skin to brighten the tone. It is a superb combination of vitamin C and retinol. 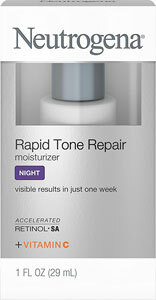 Neutrogena Rapid Tone Repair Night Moisturizer reduces the most stubborn dark spots for a younger looking skin. It improves the skin clarity and radiance by diminishing the dark spots and blotchiness. The key ingredients of this night cream are vitamin C, cocoa butter, jojoba oil, and grapeseed oil. Toulon Resurfacing Night Cream protects and heals your skin with a proven anti-aging moisturizer. It moisturizes and repairs the skin. It clears acne and breakouts without clogging pores. This cream hydrates, exfoliates, and brightens your skin by working the entire night. It is safe for all skin types including sensitive, thin, oily, and dry. This night cream helps your skin to fight back against environmental damages. It hydrates your skin entire night to give you a glowing tone in the morning. Vitamin C of this cream fights free-radicals to keep your skin safe from oxidative damages. Murad Essential-C Night Moisturizer encourages the cellular turnover and rejuvenates the skin. It’s shea butter makes your skin silky smooth with an instant hydration. Apply this cream on your face, neck, and chest every day after cleansing and toning. This nice cream helps to rejuvenate your skin by boosting collagen production. Pure Bliss Night Cream is a worthy skincare product with vitamin C, hyaluronic acid, matrixyl 3000, tripeptide 5 and much more. This cream is effective on dry, oily, sensitive, and acne-prone skin. It is completely natural and organic. It helps you to get a healthy skin with proper hydration and gently exfoliation. 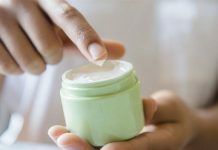 This cream also protects your skin from sun rays and pollution. 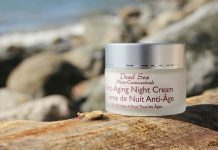 This is an organic and natural night cream for sensitive skin. The key ingredients of this night cream are vitamin C, jojoba oil, rosehip oil, and chamomile. Retseliney Revitalizing Vitamin C Night Cream is effective for all skin types. It nourishes and hydrates your skin for a healthy look. It gives your skin a young look by reducing the effect of fine lines, wrinkles, sun spots, and uneven skin tone. This is an effective night cream for all skin types. It contains a unique soft formula to refresh tired skin. 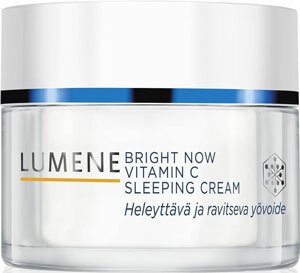 Lumene Bright Now Vitamin C Sleeping Cream protects your skin from oxidative damages with the power of arctic cloudberry and vitamin C. This night cream brightens the skin and balances the moisture inside it. It helps you to retain young looking skin by fighting the aging signs. Try it every night before sleep to glow out next day. This is a cool night cream for face and neck. It contains a perfect blend of vitamin C, hyaluronic acid, and marine collagen. Both men and women can use this cream for their daily moisturizing purposes. It is perfect for all skin types including dry and oily skin. 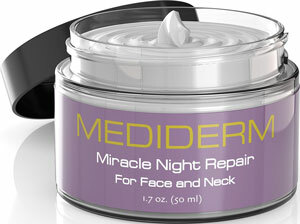 Mediderm Miracle Night Repair Cream hydrates lifeless skin instantly to give a healthier look. It absorbs quickly into the skin for more effectiveness. This vitamin C infused night cream exfoliates skin for cellular regeneration. It also fights free radicals to restores skin damages. You can use Block Island Revitalizing Night Cream to hydrate your face, body, and neck. This cream is great for all skin types including sensitive skin. It nourishes your skin with cocoa butter, rosehip, avocado, aloe vera, and jojoba. It penetrates deep into the skin to lock moisture. Apply this daily for softer and smoother skin. These are the best vitamin C night cream. Hope, these creams will give you a glowing look by repairing the damaged skin. If you know any other night cream with vitamin C that works fantastic, please share with us.